Dig in to spring at Upper Noe Rec by signing up for classes, seeing the stars and attending community events. Or just sit back and catch up on budget issues in this month’s newsletter. No matter what, don’t forget to give us your feedback on the Sandbox Conundrum. Sandbox Conundrum – We need your input! First would be to cover the box at night with a lid heavy enough to keep out the cats. 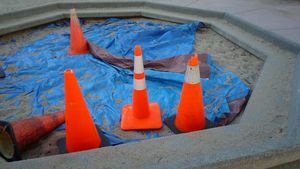 This means that when park staff are not present on Sundays and Mondays, the sandbox will be covered and inaccessible. If park users agree to keep the sandbox closed and inaccessible on Sundays and Mondays, we could start looking for a cover. The second option is to remove the sand and install the rubberized flooring that is used in the playground. This option would leave the same basic configuration; the only difference would be that the sand would be removed. The third option is to fill in the hole, rubberize the space and install some other play equipment in the sand box area. The sandbox does not have a “bottom” and would need to have concrete work done to install the rubberized material. In addition, the location of the sandbox makes it difficult to access by larger machines. These factors add to the cost of the second two options, which are estimated to be between $10,000 and $15,000. Rec and Park is facing huge budget cuts and would not be able to fund these costs, but as a community we can raise the money to make this change. The Friends group also has money to put toward this capital improvement. The Friends Group is trying to facilitate a discussion about what park users would like to see happen. We will let Rec and Park know what people tell us. We will be holding aFriends of Noe Valley Recreation Center meeting on Wednesday, March 9, at 7 p.m. and we would like people to come to discuss the sandbox. If you cannot attend, please email comments and suggestions to Kate Haug. Topics will include: the children’s playground sandbox, upcoming renovation plans for the Sanchez street side planting and an additional bulletin board on 30th Street. Please join us for a meeting about how to maintain and improve your park. Questions? Email Kate Haug. Just want you all to know that next Saturday is the second Saturday of the month, and it’s Gardening Day at the park. Come and join your neighbors – have some fund – teach your children the joy of volunteering – plant some spring bulbs – feed the birds – help put up more birdhouses. We need your help to keep the park our neighborhood park for us all. Bring gloves, tools, water, your family and invite your neighbors some fun in your neighborhood park. Questions: Email Joan Lionberger. Be a NERT starting February 24! The Upper Noe Neighbors and San Francisco Fire Department are sponsoring a six-week emergency response training program on Thursday evenings Feb. 24 to March 31 at the Upper Noe Recreation Center. Attendees will become Neighborhood Emergency Response Team (NERT)members trained in everything from how to wield a fire extinguisher to gauging which medical conditions warrant a trip to the hospital and which can wait in the event of a major emergency. Sessions will be at the Rec Center and they will run from 6:30 to 9:30 p.m. from on Thursday evenings, February 24th to March 31st. To register, please email sffdnert@sfgov.org or call 415-870-2024. Kick-boxing, Pilates or tennis, anyone? Upper Noe Rec has added 12 classes for the spring term, and there are now 55 classes for children and adults. To see listings and sign up, visit SF Rec Online. The center will host two summer camps that start June 6 and run eight weeks from 9 a.m. to 3 p.m., with extended care available from 8:30 a.m. until 6 p.m. Scholarships are available through SF Recreation and Parks. SF Rec and Park and the SF Fire Department’s Flame Athletics present the San Francisco Youth Baseball League, the oldest and largest youth baseball league in the city. Last year more than 1,500 players played on 115 kindergarten t-ball through 8th-grade kid-pitch teams. There are two ways to sign up: For team sign-ups, coaches can register on the SFYBL website. For individual sign-ups, parents can visit here. Baseball is one of the many “league” sports hosted at Upper Noe Rec. Over winter, the site was home to a second-grade basketball league, meaning two second-grade teams each had the gym twice a week: once for practice and once for a game. They then play other second graders from other rec centers. Leagues are open to all children. Enroll your child based on age and location or register an entire team! Facility director Joe Scott is working with the Randall Museum to bring a portable planetarium to Upper Noe. Starting in early March, star gazers can search the skies one night a week for eight to 10 weeks. If the program is popular, Scott says, he will bring it back in the summer. For more information, call the Rec Center at (415) 970-8061. The Recreation and Parks Department must cut its budget by at least $4.1 million this year, but General Manager Phil Ginsburg is hoping to maintain all services anyway. “Rather than cut, we want to raise money,” said Ginsburg at one of the four community meetings the department hosted to gather creative funding ideas and gauge public priorities for the parks. Revenue from concerts, concession stands and classes now account for 40 percent of the department’s $127 million budget. New fees have prompted criticism—some members of the Board of Supervisors want to eliminate the $7 out-of-towners now pay to enter Golden Gate Park’s botanical gardens, for example. The department has also been successful finding private partners to fund capital improvements and will now seek private funding for the operations like maintaining rec center hours, Ginsburg said. Grants, corporate sponsorships—all donors are welcome, Ginsburg said. “I don’t give a rat’s you-know-what where the money comes from,” he said. The department must submit its budget to the mayor’s office by Feb. 22. That budget then goes to the Board of Supervisors, who can move money from one department to another before sending it back to the mayor for approval. The Board examines each department’s budget during the second and third weeks in June. Ginsburg said rec centers will post the dates when the Rec and Park budget will be addressed, and he urged the public to attend and advocate for park funding. In March Rec and Park staff must also meet with the Recreation and Parks Commission to come up with an additional $2.6 million in “contingency cuts,” which the mayor has required of all city departments. The Friends group often gets questions about how groups can rent the Upper Noe Rec Center. Both the gymnasium and auditorium are available for rental. Some groups rent the facility on a regular basis, and some groups just for one-time events. To rent the space, the SF Rec and Park Department Permits and Reservations Office has created an Indoor Facility rental page in addition to the Athletics Field Request form. Apply online for renting the Indoor Facilities here.